The New Dork Review of Books: Will the Winter's Tale Movie Be Any Good? 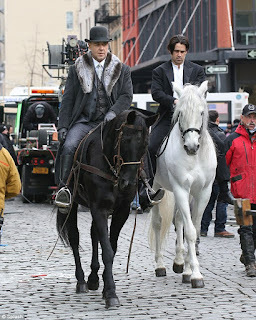 Filming has wrapped on the movie adaptation of Mark Helprin’s much-loved 1983 novel, Winter's Tale. And this one has some real star power behind it — Russell Crowe, Colin Farrell, Will Smith, and Jennifer Connelly all have roles in the movie (release date yet to be announced). But will it be any good? Let’s take a look. Source Material — This is a tough one. If you count yourself among the approximately 75 percent of readers who loved this book, your confidence is probably much higher than mine is regarding this long, surreal story. I’m in the 25 percent who didn’t love it, so my confidence ain’t great. But I DID love the first 200 pages that tell the turn-of-the-century story of Peter Lake and Beverly Penn, and Pearly Soames and the horse Athansor. If the movie focuses more on this part of the story, I’d grade out the chances of success to be much higher than if it tries to include the whole freakin’ book, which is is 700+ pages long. Finally, on the plus side, one of the things that bugged me about the book — its overwrought, often-way-too-flowery imagery — could be a boon for the movie. Could be beautiful. Cast — This is a definite strength for the confidence index. My hesitation is Crowe as Pearly Soames. I’d read Soames as more of a Bill the Butcher (from Gangs of New York)-type character, not a debonair villain, as it looks like Crowe is playing him. Am I wrong about this? The rest of the cast, again, is fantastic. Farrell (an Irishman) is a natural choice for Peter Lake. Wild Card — A couple things here: The budget for the movie is reportedly a mere $46 million, cut from an original budget of $75 million. That doesn’t sound good — since the aformentioned imagery/cinematography could have certainly benefited from some fancy effects. Forty-six million sounds like it could be the salaries of the four principal actors alone! Additionally, the film earned the ire of some of Red Hook, Brooklyn residents last year when it continued to film soon after Hurricane Sandy, taking parking spaces and resources from residents trying to recover. Not sure if this will have any effect on its box office, but it’s something.